Pours a nice copper with some ruby coming trough with immaculate clarity. There is a tiny, slightly off-white head, that resides before I can even take a sip. This was the big knock on the appearance. As for the aroma: it has somewhat of a nice malt bill with some slight hops, but nowhere near deserving respect or commendation. The flavor is just as disappointing as the aroma. It has an identical malt bill with a slight hop bite. There is no complexity or depth and lacks that certain something that urges one to savor the sip. The body is light and the finish is somewhat dry. Like I said, I wanted this beer to prove me wrong, to show me that AB could make a worthy beer, to show me it's ok to enjoy a beer from a major brewer, but they haven't shown me anything. Thank god I have 2 roommates to finish the 6-pack I bought that I will not finish. Beer snobs will never understand what an achievement this American Ale truly represents. 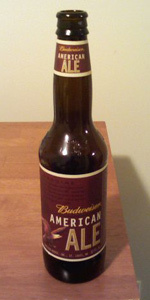 Unlike the Michelob portfolio which concerns itself mostly with the parameters of any given style, Budweiser American Ale does something that is highly unlikely from Anheuser-Busch, they have created a beer with a distinctive personality. Having tasted many many American ales, from Samuel Adams, Goose Island, Saranac, Sierra Nevada, Anchor, Stone, Ballantine, Bell's, you name it... Budweiser Ale belongs with all of these. I could recognize this tasty ale in a blind taste test. A dry-hopped recipe with personality. From a 22oz, poured into a glass. A. Budweiser American Ale poured a light, translucent red, with, believe it or not, a nice frothy head. Yes, there is lace, too. Great carbonation rounds out a very good-looking beer. S. Not too much going on here, Just a fresh "ale" scent. T. This is where I was blown away. It has a nice, subtle hop taste to it, nothing overboard, but yet what do you expect with AB. I wasn't looking at this as a top 100 beer, and wanted to rate it based on what a mass produced semi-craft beer could do. This rated highly with me. M. Very juicy. No one flavor takes over, its a combination of them that gives this beer a great mouthfeel. Nice and dry on the way down, leaving you to want another drink. D. Very much so. Beer snobs be damned, AB has created a beer that has taken my $ away from Sam Adams when I want a solid American beer. Pretty amber color, decent tan head that leaves some lacing behind as it fades to a thin layer. A nice light malty aroma, with a bit of a hop spice in the background. All very subtle but nice nonetheless. Taste is somewhat less subtle, caramel malt with some roasty notes and some hop character. It dries out quickly and finishes pretty fast, there is a slightly lingering hop twang but again it is subtle. This beer has some body, and it's fairly smooth and nicely carbonated. Sure I would drink another. The local price alone would keep me from buying this beer, so I appreciate the fact that someone brought a sixer to a party I had last weekend. Purchased as part of a six pack. Pretty cool twelve ounce bottle poured into a pint glass. Pours a nice reddish amber color. Very clear with bubbles rising in the glass. Pour produces about two fingers of off white head. Decent retention and leaves some lacing. Smells quite malty. Aromas of sweetness and caramel. I know the commercials claimed that this beer was dry hopped with cascade hops, but I'm really not getting any hoppy aromas in the nose. I think I'm getting some fruity esters though. Taste is a lot like the nose. Mostly malt. It's pretty sweet and there is a fair amount of caramel flavor. Also a bit of toast in there. This ale finishes with a bit of tea like bitterness, but not much. It is a bit dry. There is a residual sweetness that clings to the tongue. I noticed some people said it tastes like Bud or Bud Light, but I don't taste any similarities. Mouthfeel is ok. It's about medium bodied. Decent amount of carbonation and some smoothness. A little watery too. I know it's not Bud Light, but it still has plenty of drinkability. It's not amazing or anything. It's doesn't have any complexity and I'm not getting much in the way of a hoppy presence. It's a million times better than Budweiser's adjunct lagers, so I've got to give them credit for that. If the choice is between this or a BMC lager, it's this in a landslide. It's good to see the BMC companies branching out and trying to make better beer, but for now, this doesn't stack up against the craft offerings that I've tried. To say I have a favorite beer would be a lie, but the beer I seem to be buying every week seems to be this american ale. It has a beautiful copper / dark red color. You can smell a little malt, nut, and hops, but not much. It has a very mild aroma. Good taste with a light feel for an ale. As I said it seems to be the only beer I'm buying nowadays. Bonus, the bottles are very pleasing to the eyes. Which is good since I use them for homebrew. In my opinion one of the most under rated beers available. I think most people forget how amazing beers are that are produced by AB. Especially on this highly skewed website. I think if blind taste tested more this beer would score a lot higher. It's really too bad because I know in a few years, we won't be able to find this one on tap. Ok... first off, I had the bar tender pour into a room temperature pint glass. It formed a very nice head and really nice dark amber color. I really wanted to give this beer a fair shot because I know how hard people are on AB brand beers. I let the beer sit for a few minutes so I could really taste it... Wow! Could this be? A brewery that is known for consistantly brewing filtered easy to drink lagers actually knows how to brew an amazing ale??? I love the taste and although not highly hopped, there is a lot of flavor. I actually prefer a lighly hopped, more roasted malt flavor so maybe this is just more my style. This beer seems to have a light mouthfeel but amazing clean and crisp finish kind of like AB's flagship beer. I really wanted to hate this beer, but just don't have anything bad to say!!! Pours reddish amber with a thin off-white head that becomes a disappearing patch. Virtually no lacing sticks. The smell is of caramelly maltiness typical of a red ale with a light citric note. The taste is of caramelly maltiness with a slight hint of toast and a gentle, bitterish, lightly citric, dry finish. To call this full-bodied, as they do on the label, is going way too far, but it does hit medium-bodied with soft carbonation. Smooth. A very drinkable amber/red ale. This was a pleasant one, though there is a bit of the "Bud" aftertaste. Personally, I would have liked to see it bigger, esp. in the hop department (it just has a hint in the aroma and the finish - though it never becomes too "imbalanced" either). An easy-drinker at a good price - would be a nice, easy "intro" to American ambers. poured from bottle. nice color with an inch thick head to the top of the pint glass. smelled good, but didn't jump out @ you. taste was a little weaker than expected. felt very thin in the mouth. left a slightly unpleasent aftertste. average beer at best. This is a good attempt by Budweiser. If you go to a lame bar that has a good deal for Bud Ale on tap it is totally worth it. If you can find these type of deals then it actually ends up being cheaper than its lame cousin Bud Light. The thing that is great about this beer is that it's affordable, at $1.99 for a 22oz how can you loose? Single bottle from the Davis Co-Op purchased on a whim. Pours extremely clear and reddish brown to terracotta. Short wispy white head falls off to near nothing. Laces in a watery fashion. Apple and vague diluted malt odor, very faint aroma overall. Flavor is thin, some apple and malt sweetness. Vague hop presence, mostly in bitterness but a bit of grassy flavor too. Hint of caramel. Everything is so...non-assertive. So plain. Tastes clean, if that's something. Thin bodied. Meh. I bought a case of this because I thought the bottles were nifty looking for homebrew purposes. That said, it's not a bad beer, and would be something to consider if you're throwing a party and need to get some drinkable stuff (reads: not piss) on the cheap. A: The appearance is quite good. The head is foamy -- not fizzy -- and sticks around for a little while. Lacing is present, although not pronounced. Color is a nice, deep amber-red. S: I'm getting some malt and hops, but nothing like what you'd expect from a good craft brew. T: Taste is not bad, and improves as it warms up a bit (~50-55*F = about ideal). Malt is detectable, as are hops if you're looking for them, but I do get the impression it was thinned out with adjuncts. M: Mouthfeel is good. A touch thin, and perhaps slightly over-carbed. D: The drinkability on this one is quite good. It's not a knock-your-socks off, taste explosion, but by the same token there's nothing about it that's off-putting in this regard. Overall, this is kinda like a craft brew on a diet, if that makes sense. Not bad by any means, but for only five or ten dollars more per case, you could scoop up Sierra Nevada or any number of superior brews. Again though, about perfect for a party where you need maximum number of decent beers for the lowest possible price. Pours a very clear, light brown body. Huge foamy whitish head, pillowy. Bitter aroma, malty, piney, but not very strong. Bitter taste, with a malty middle,, and a bitter nutty aftertaste. Very fizzy, but a somewhat watery palate. A harsh carbonation. Maltiness. Not much else, not a complex flavor. Slight drying in the mouth. Smells like a macro, tastes overly bitter and overly metallic. It's like a cross between a macro and a craft beer, i'm not sure if I got a bad bottle of this or not. A little grapefruit note, not a whole lot there. Mouthfeel is heavier than a macro but not much more. Not that drinkable due to the taste. Honestly I think that Michelob Amber Bock is a better beer than this but that isn't saying much. I really think that a Sierra Nevada Pale Ale clone would've been a much better beer for Anheuser-Busch to label as an "American Ale". This isn't something I would ever buy personally because there are so many better beers out there. Pours a nice rusty copper color that's pretty clear and shows evidence of quite a bit of carbonation. The white, foamy head is the highlight of the show here, it pushes up to about two inches tall and has pretty nice retention. Decent amount of lacing is left after the head dissipates, too. The smell isn't too impressive, it's not bad, just not great. Sweet and toasty caramel malt is most prevalent and a distinct lack of adjunct graininess makes it unoffensive and somewhat pleasant. A very slight hoppiness is present in there as well, but it's pretty muted and seems to be an afterthought. The taste is pretty decent, too. Certainly a lack of the typical Budweiser grainy adjunct flavor, which is a plus, and although there's some good ingredients to work with, there's not nearly enough of them. There is a nice toasty, caramel malt flavor that shows up nicely, just not as strong as I'd like. Coming into play after that is the slightly citrusy hop flavor, but man they need to beef this up a bit more as well, it's barely there. The mouthfeel is the weakest part. It's thin and slightly bubbly, but I see why AB did that. They don't want to shock the palettes of their dedicated fans who might be trying this for the first time. Overall, this is pretty drinkable. I got a bunch on sale today to distribute at a party I'm having this weekend, so hopefully it will work well as a transition beer/ experimental beer for those who normally drink BMC lagers. Anyways, I liked this pretty well for what it was, if it was my choice I'd have Bud amp up the flavor a bit more, but I can see how they don't want to offend any of their loyal fans. Still, probably the best I've had from them. A: Poured into a pint glass. Body is coppery-amber with a 1/2-finger khaki head. Slow-rising bubbles. No lace. S: Malt dominates the nose: some bready malt, caramel malt and a hint of basic cereal grain. Not terribly strong in the nose, but appropriate for the style, I guess. Torn between a 3 and a 3.5 here, I gave A-B the benefit of the doubt. . . .
T: First impression is really about the mouthfeel, not the taste. And that doesn't bode well. It's too light, slightly watery and thin, actually. And too carbonated. As for flavors, sweet caramel malt up front is immediately washed away by an active carbonation. Finishes with a metallic/minerally bitterness that reminds me of Budweiser, somehow, and which lingers into the aftertaste. That lingering dry metallic bitterness is not terribly pleasant, actually, though as it warms it becomes a tad bit sweeter. M: See the above comments. In a nutshell, it's too light in heft, watery/thin in feel, and the carbonation, while fairly fine in feel, is just too active. D: OK. Originally gave it a 3.5 but decided to lower it to 3 as I worked my way down the pint glass. It's just not something I'd likely order again, though if I was at a bowling alley and there were no BBC products and it was b/w this and adjunct lagers, I may order this. 3 of us tried this beer at a recent beerfest in Tucson- all 3 of us had an open mind. There was almost no taste to describe- although it was not particularly awful tasting, we had many beers to compare it with and it was definitely the least flavorful. All 3 of us dumped the beer after 2 sips. Bottom line is that it is a weak effort and not worth spending your $6 on if you have a choice. Perhaps if you had to choose between natural light or beach bum blonde, maybe it would be a choice, but if you like a flavorful ale do not bother. I would give more detail about the flavor profile, but none of us were able to discern and actual flavor. Ok...so I felt like it was about time I tried this beer. I've heard such mixed reviews and certainly am not ready to pay 5 bucks to taste it at a bar so here goes nothing. 6 pack from the ralphs down the street, woohoo. I don't really know what I expected from this beer initially. The pour was a lot cleaner than I thought it might be. A nice reddish amber color that's nearly transparent. About 1/4 inch of foamy head dissipated almost as fast as it appeared with a bit of patchy lacing on the way down. "Dry hopped with cascade hops..."
Maybe they're doing it wrong? I don't know. I don't really get much cascade on the nose, if any (or any hoppy smell either). I get a ton of sweet notes of caramel, malt, and caramel malt. Needless to say...not impressed. They lied to me. Ok so the taste really isn't as awful as I've been thinking it might be. Dominated by the same notes that the nose has--caramel and malt. It's a pretty malty beer for all the stock they put in the "pacific northwest grown cascade hops" and the "hoppy finish" they describe just doesn't find it's way into my mouth. The finish is a little bitter maybe. The aftertaste isn't spectacular to say the least. It's alright with me, though. The beer is light to light-medium bodied with ok carbonation. Again, nothing spectacular, nothing out of the ordinary-just a pretty boring beer here. W/r/t drinkability I'm gonna have to go with...whatever, not really. I don't think I'd drink this beer again (I wouldn't shell out money for it at least, but that's a whole 'nother story). Bud ought to stick to the adjuncts that they do best, is my final decision.